"Perfect Hair Stencil Designs, Every Time!" Please Call (800) 406-7711 to Order. Why use Mr. Hair Art Stencils for Hair Art Designs? For Barbers, TIME IS MONEY so what better way to increase your income than to offer a new add-on service that you can execute in just a few minutes that could potentially double your income! We hear it all the time that barbers take 45 minutes to over an hour to Free-Hand a design and so they avoid offering designs as a service. Why not just get the tools to get the job done quickly and correctly? It makes perfect sense, like when clippers were invented to speed up the traditional scissor hair cuts. An extreme time saver and more accurate. Also by buying the Stencil Kit, your customers can see you have a Collection of Stencils, they literally will be booking their next few appointments with the "Next Design" they want to have cut in their hair. REPEAT CLIENTS! Business Law: It's easier to keep a current client happy vs. trying to acquire new ones. Our Hottest Hair Design Tools are our Mr. 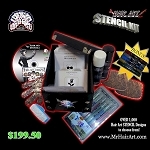 Hair Art Stencil Kits and you can pick each of your Barber Stencils from over 1,000 Designs here in our online store. It comes with everything you need to get started with our Salon Stencils whether you want to cut in the hair design or just spray in the design for your clients to wear. This Kit is perfect for Professional Barbers, Non-Artistic Barbers, Student Barbers, and even Professional Stylists. It's sold in the USA and Worldwide here at www.MrHairArt.com.